Pictured at the presentation are Pauline Dawson, Frank Griffin. Caroline Folland, Dave McBride, John Wren-Potter, Stu Warrington and Keryn Jenkins. Few Masons can claim to be TV stars but, as far as the Queen Mary Maternity Centre in Dunedin Hospital is concerned, they were very pleased to receive the four TV presenters from Lodge St. Patrick who presented Charge Midwife, Caroline Folland with a cheque for 1,000 dollars to assist the Centre purchase TV sets for their Ward rooms. The Queen Mary Maternity Centre is the only birthing unit in Dunedin and provides the full range of primary, secondary and tertiary maternity services for the Otago area, and tertiary (highly specialised) services to Southern District Health Board. The unit offers antenatal, delivery and postnatal services, a Lactation Consultancy Service and evening antenatal classes. The emphasis is on supporting families, education, and self-care. “It’s not much fun being in hospital long term with a delicate pregnancy and you can’t get up, and you can’t go out, and there’s little to do, and you just have to lie there until the situation is sorted out,” Caroline told us. She had previously written to Lodge St. Patrick explaining that one of the worst tortures of long-term pregnancy complications or illness, was boredom. One of the solutions, it had been decided, was more TV sets showing news, soaps, documentaries, or whatever was fancied, just to keep such patients occupied and their spirits up. “People get better quicker when they are happy”, she added. But how’s a group of midwives to cope if they need something that they cannot have because the hospital’s financially overstretched? Well in this instance, they asked for Masonic assistance and Lodge St. Patrick was delighted to help. So on a cold, crisp afternoon the Lodge sent down a small party, with its equally small Immediate Past Master, W,Bro. 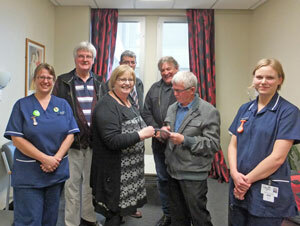 Stu Warrington, to hand over a donation to buy the requested TV’s for three of the maternity department’s rooms. Later Acting Charge Midwife, Lynne Steiner told us that the TV sets had been “much appreciated” and that the midwives were delighted with the Lodge’s generosity. She explained that, although it might seem a little odd, entertaining the long-term patients and keeping them more content was all a part of nursing. Lodge St. Patrick’s TV stars were led by the I.P.M., W.Bro. Stu Warrington (centre), and consisted of R.W.Bro. Professor Frank Griffin Dep.Prov.G.M., W.Bro. Professor Dave McBride PM and W.Bro. John Wren-Potter PM. The three nightingales pictured with them are Midwife Pauline Dawson, Charge Midwife Caroline Folland and Midwife Keryn Jenkins. Copyright © 2012 - 2019 | Lodge St. Patrick No.468 I.C.